If you don't want to miss a single moment of me ruining artichokes, you should follow us on Facebook! The 1 millionth follower gets a free Jen & Nate Buy the Farm . . . Share baseball cap (valued at $9.99). Don't miss this amazing opportunity! Each spring I like to attempt, again, to do something with artichokes. I purchased a couple of artichokes for Easter then forgot I had them until I discovered them in the crisper last night. They were a little past their prime so I was forced to do something with them this evening. The first time I ever really learned about how to prepare an artichoke was from Jacques Pepin. He had a show on PBS when I was in culinary school and my mother used to watch it all the time. I don't think this is the actual video I saw as it is undated but it was something very similar to this. Artichokes always worried me so this video gave me the kick in the pants to try preparing them. I never really got the hang of it and every time I make artichokes I always imagine Jacques Pepin's ghost hovering over me and shaking his head in disappointment. This is very unusual especially considering the fact that Jacques Pepin is still alive. I took out all the items in my fridge that I was tired of looking at and decided, after steaming the cleaned artichokes, that I would prepare each halved artichoke in a different way. This would maximize the amount of ingredients I was able to clear out of the fridge, freezer, and pantry. The first artichoke I made with some leftover tasso, cornbread, and cotija cheese with a little melted butter and smoked paprika. This was Jen's favorite as it incorporated cornbread in a stuffing form which is one of her greatest culinary pleasures. For the second artichoke I used the remaining pesto from last night, some roast chicken from Sunday's dinner, sliced grape tomato, toasted and crumbled rosemary bread, and shaved Robusto cheese. 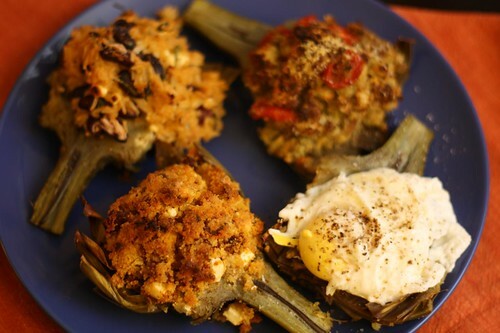 The third artichoke was filled with rice, kidney beans, cilantro, smoked paprika, cumin, feta, and a little lime juice. I served the last artichoke simply with a poached egg, a drizzle of lemon juice, some cracked black pepper, and truffle salt. I gave this one to Jen first to get it out of the way since she has a strong dislike for eggs, particularly of the poached variety. 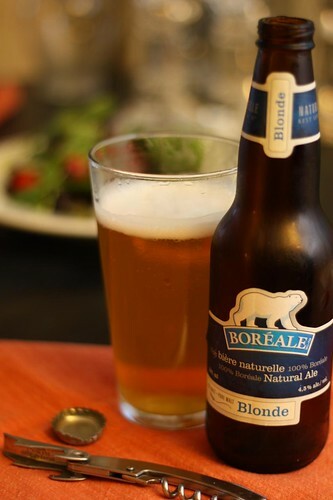 To wash down this odd collections of poorly-prepared artichokes I selected the blonde beer from Boréale that's we'd picked up on our weekend jaunt to Montreal. I don't know what the prescribed beer pairing for artichokes generally is but since there was no real theme tying these artichokes together it worked out just fine. What thing will we clear out of our fridge next? What Canadian beer will we pair with it? Tune in tomorrow, or maybe the next day, or maybe next week, to find out!